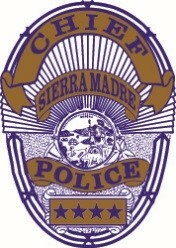 Press Release posted 7/27/15 – On Friday July 21, 2015 at 8:15 PM a Pasadena resident was traveling to a friend’s home in Sierra Madre when he was confronted by armed suspects. The victim was traveling eastbound on Sierra Madre Blvd. from Michillinda when he noticed a dark colored sedan tailgating him. As the victim stopped for the stop sign at Sunnyside Ave., the suspect vehicle pulled up on the left side of the victim’s vehicle. The victim looked over and noticed that there were four occupants in the vehicle. At first he thought it may have been some type of road rage issue, but then noticed that the male in the right rear of the vehicle was exiting the vehicle with a handgun in his hand. The suspect opened the driver’s door of the victim’s vehicle and told the victim to give him his property and car. The victim, fearing for his safety, accelerated away from the area forcing the suspects to retreat. The suspects were last seen making a U-turn and fleeing westbound on Sierra Madre Blvd. The suspect vehicle is a dark colored 4-door sedan, unknown make or model. It was occupied by a Caucasian female approximately 18 to 20 years old with brown hair, who was sitting in the right front seat. The armed suspect, who was sitting in the right rear seat, was described as a Caucasian male, short brown hair, approximately 20-25 years old, 5’ 10” tall, wearing a blue or turquoise colored polo shirt. The weapon was described as a black semi-automatic handgun. There was no description on the driver or left rear passenger in the vehicle. Director of Public Safety, Chief Larry Giannone, stated “we are fortunate that no one was hurt in this incident and that the victim was able to retreat in a safe manner without the loss of any of his property.” Chief Giannone also reminds members of the community that it is a good safety measure to keep your vehicle doors locked while driving. Anyone that may have witnessed this incident or has any additional information are urged to contact the Sierra Madre Police Department at 626 355-1414.